There’s some very weird rumors about Supreme Leader Snoke’s appearance in The Last Jedi. Loki’s plans in Thor: Ragnarok are revealed. Josh Brolin smashes a mirror for Deadpool 2. Plus, new images from Once Upon a Time’s return, Star Trek: Discovery episode titles, and new footage from Kingsman: The Golden Circle. Behold, spoilers! 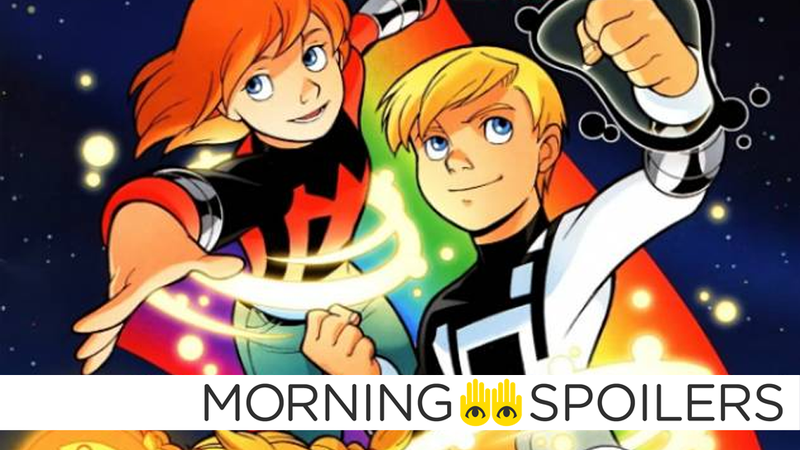 Salt shakers are the ready, because That Hashtag Show claims that a Power Pack movie, based on the comic book family of superheroic kids, is being considered once more for a movie adaptation in the Post-Avengers-4 MCU. Speaking with Forbes, Frank Grillo revealed there’s some forthcoming “news” regarding his character, Crossbones, indicating he may have survived his seemingly fatal explosion in Civil War. Variety reports Dame Judi Dench has joined Kenneth Branagh’s Artemis Fowl adaptation in an undisclosed role. What’s Filming reports the fast-tracked Shazam! goes behind the cameras in Ontario, Canada next year. Speaking with Screen Rant, producer Brad Winderbaum revealed that Loki is (naturally) responsible for the arrival of Hela. [When] we left Loki, he kind of achieved his goals, he became the king of Asgard, and he is ruling that place. And what we come to learn, what Thor comes to learn early on, is that there’s a lot of terrible things in the cosmos that just shouldn’t be that way. And we learn that Odin was doing far more than it seemed on the surface to keep the universe safe. There were all these threats that he had quelled or was keeping at bay, using his strength and power to do so, that Loki was completely unprepared for. So he becomes the King of Asgard, everything is great, it’s a good party. But he failed to realize the threats that were just over the horizon, Hela being the biggest and most terrible one of all. Cable smashes his face into a mirror in a mysterious new photo courtesy of Josh Brolin. Jack Black continues to can’t even in the latest TV spot. Meanwhile, a new Kingsman TV spot imagines itself as an advert for villain Poppy’s criminal organization, the Golden Circle. Set pics from the film’s shoot in Vallejo, California reveal Georgia Street has been given a 1980's makeover, including a video rental store, record shop and even a Montgomery Ward. Omega Underground has discovered audition tapes for the role of Beast Boy on Vimeo, if you want to see multiple actors running lines for the beloved Teen Titan. In related news, TV Line spoke with Sonequa Martin-Green about her excitement for the new Star Trek during the red carpet pre-show at the Emmys. Here’s a quick found footage-style teaser of Frank Castle stabbin’, trappin’ and threatening some military guys in some not-so-dense woods. We also have a four-minute trailer for the completely unhinged new season of Gotham. TV Line has 34 new images from the season premiere/soft reboot, “Hyperion Heights”. More at the link. Finally, a new promo heralds the return of Captain Cold... or at least, some version of him, given the time-travel-y shenanigans the character’s been through on Legends of Tomorrow.